This month’s Inside-OUT exhibit is reliquary of found-art treasures, amassed in a thoughtful whimsical fashion by Martha Friend. She is an assemblage artist and hunter/gatherer who is always searching for treasures on the road side, at the beach, at flea markets, (and yes) the trash. 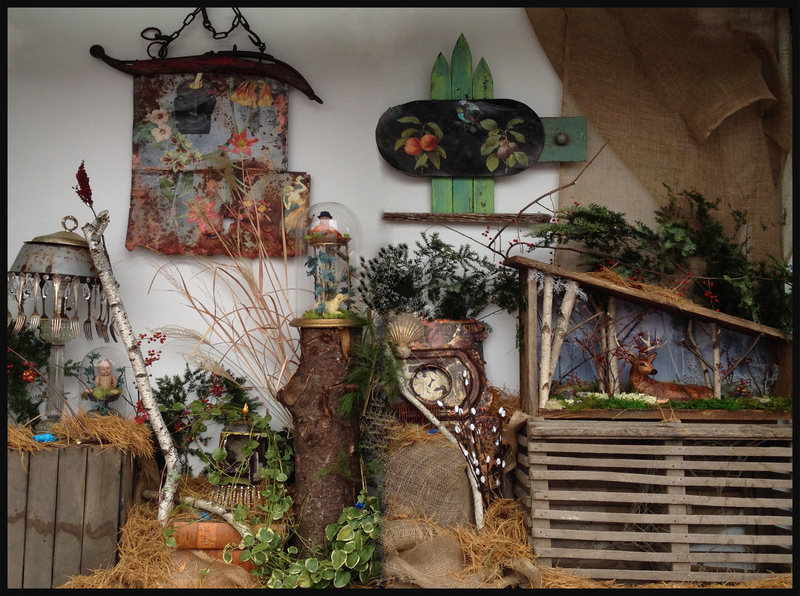 Each piece is transformed and incorporated in assorted wall pieces, dioramas, lamps, and sculptures. As an avid nature-lover, she continues to explore and work these outdoor themes in her installations as often as possible. Martha comes from an old New England family who saves everything and totally believes in picking the trash, surrounded by sheds, barns, and outbuildings bursting with stuff that “someone could use someday”. Need a pull-out couch? Pots and pans? A cast iron stove? Not a problem. Scrounging, collecting, saving, and re-inventing are in her blood. She has always been taken with the flotsam and jetsam one finds at the beach, or in the woods, or by the side of the road. As an art archeologist of sorts, she loves digging in old dumps and other unexpected places which ignited her love affair with rust. Sparkly objects, iridescent paint and costume jewelry wide variety of materials find new life in the necromantic dioramas, collages, and assemblages. Vintage printed images, organic detritus, and all manner of treasures have been collected over years from various locations such as old Montana ghost towns and local flea markets to Albuquerque, NM. Her work tells a story, evokes a mood, or makes a statement about a larger idea. Her visual training comes partly from years spent as a professional photographer where she learned to focus on every detail. She has a great respect for so-called “outsider” or “folk” artists, people who make art from the heart and with whatever materials they have at hand. Everything has the potential to become something else, and almost everything has the potential to be beautiful, especially when lovingly joined with other emerging, ripening, and expectant objects. About the Inside-Out Gallery Initiated in 2009, The Inside-Out Gallery is located in the CVS Window in Davis Square, a unique space that allows the public to view an eclectic array of works from artists and local organizations each month. The mission of the Somerville Arts Council is to cultivate and celebrate the creative expressions of the Somerville community. Through innovative collaborations and quality programming we work to make the arts an integral part of life reflective of our diverse city.